What are the complications of a fracture? A fracture (broken bone) is a common injury often caused by excessive force being applied to a bone. There are many different types of fractures and some are more serious than others. The first aid treatment of a fracture is aims to control any bleeding and immobilise the injured part to prevent further damage. 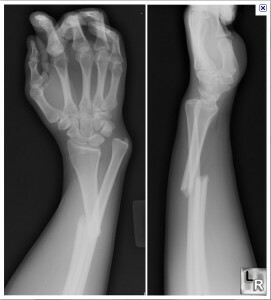 There are a number of complications which can occur after a fracture. These complications can be serious so it is important that early medical assistance is always sought. These complications can cause significant disability for many months / years after a fracture has occurred. Prompt and effective first aid treatment can reduce the risks of these complications developing. For example applying a sterile wound dressing over an exposed bone end can reduce the risk of a bone infection (osteomyelitis) developing.